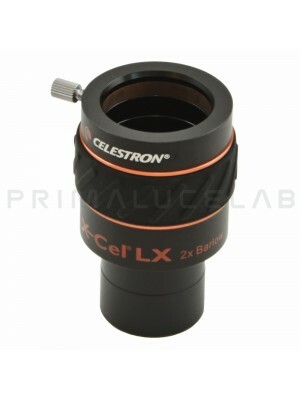 The Celestron Luminos 2,5x Barlow lens 50,8mm is one of the best Barlows on Celestron series, it's used to encrease the magnification by two and a half times with any eyepece on the market. Thanks to the 31,8mm adapter provided, it accepts both 31,8mm and 50,8mm diameter eyepieces. The 4-element lens design ensures a perfectly flat and corrected field, giving sharper images and free of false colors thanks also to the apochromatic lenses. The barrel is fully anodized and can accommodate 50,8mm filters. 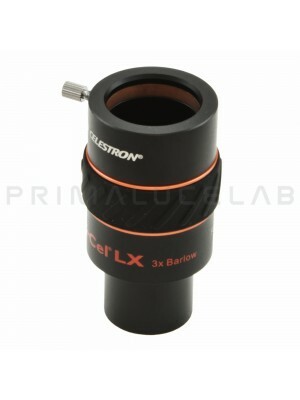 The Celestron Luminos 2,5x Barlow lens 50,8mm is one of the best on the Celestron series, i'ts used to encrease the magnification by two and a half times of any eyepece on the market. Thanks to the 31,8mm adapter provided, it accepts both 31,8mm and 50,8mm diameter eyepieces. The 4-element lens design ensures a perfectly flat and corrected field, giving sharper images and free of false colors thanks also to the apochromatic. The barrel is fully anodized and can accommodate 50,8mm filters. The tightening of the accessories is performed through the compression of an internal brass ring. The rubber side trim ensures a solid and secure grip.